Tailored clothes should not be a thing of the past. I don’t know exactly where along the line we adopted the mindset that clothing should fit right off the rack, but I do know this is a fairly modern concept and frankly just causes frustration, messed up body image, and a generation of women obsessed with yoga pants. Sewing allows you to either adjust ready-made clothing to better suit your body or to create custom garments that put your best foot forward. Modest dressing is so much easier. Being able to adjust shoulders, necklines, hemlines, and weird trims to fit our personal standards makes life just that much smoother. It also encourages me towards excellence by not just throwing up my hands and layering awkwardly out of frustration. Formal wear is more economical. Truth is, fabric is pretty expensive these days. But when it comes to formal wear, you can still make a modest dress cheaper than you can easily buy it, even from overseas. The math/ geometry/ handiwork/ critical thinking skills translate throughout life. I’ve never been naturally good at math, but the practical application of sewing has really helped me better understand complicated concepts. Becoming more skilled at working with your hands is always a good thing. Sewing your own clothes (or altering second-hand) makes you less dependent on Fast Fashion, sweat shops, and global economies. The more I learn about the $70 billion/year industry that fashion is, the more I am motivated to take a step back and get out of department store shopping. Being real, sewing can be easy but often it is just plain gritty hard work. It hurts your back, it boggles your mind, it can be inconvenient, there’s “wasted” fabric and time. But girls, it is so so so so so rewarding. I’m writing about this today because a picture from 2010 popped up in TimeHop this morning that reminded me about the lengths I used to go to get sewing time in. I was making a tunic top from a dress (more details here). Watching my baby brother who was just old enough to make a huge mess of my sewing area of course made it more challenging, but you know what? That hour and a half or so yielded a tunic that my sisters and I have worn a hundred times over the last 5 years. I may be sliiiightly more naturally inclined towards sewing than some other girls, but the misconception that my skills have come easy to me is way off base. I’ve just put in the work. Whatch’all think? Do you sew? Do you find it useful? 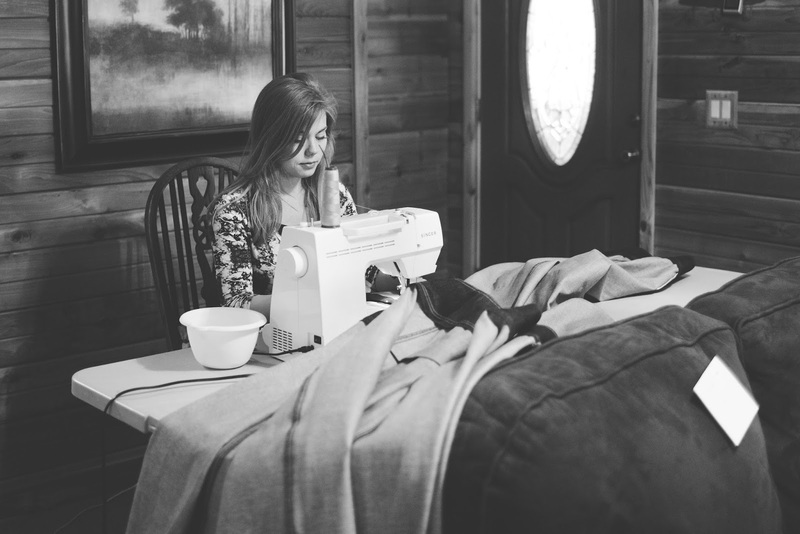 Oh, and P.S.– I’m hosting a sewing camp at our guest house September 28th-October 1st, 2015. There are two more spots available– email me at FreshModesty@gmail.com if you’re interested! Absolutely agree!! I love sewing and don't know where I'd be without the ability to mend stuff quickly, add an extra buttonhole to make a bought shirt modest, or quickly make an item of clothing to wear last minute. It's often much easier to sew something at home these days than spend hours trawling websites or dragging children round stores trying to find what you want. I've been asked so many times to do sewing for ppl that I'm sure it would make a good business if someone learnt the skills and had time to offer their services for others (just an idea for you ladies looking for something to do from home!) Thanks Olivia for the inspiration to keep at it – I've been following you for years and been impressed at what can be done by sewing yourself. I've been sewing for about 2 years now and it is becoming easier praise God,because I have tossed a whole lot of garments since I started sewing. I guess it's trial and error. But it can be very rewarding when you can make something that fits your body without having to get alterations. I totally agree. I sew my clothes all the time and people always ask me, "How do you find clothes that fit you so well?" Sewing makes dressing in general and looking good so much easier! The age difference between me and my youngest brother is 14 years as well. 🙂 In my present season of life, there is more opportunity to spend time with him and I am looking forward to making the most of that opportunity. Thanks for sharing! I love know into how to sew and agree with all 5 of your points! When I was looking for a wedding dress last year I couldn't find anything that was both modest and affordable so I decided to undertake my biggest sewing job ever. The dress was fairly plain, but modest. The fabric wasn't even that fancy because saving for a house was more important than fancy fabric I would only wear once, well until I decide how to alter the dress. I spent $42 to make my dress and don't regret it at all! I sew and i have made some skirts and pants, I did do a fashion certificate but i did not complete as they were discriminating about my disabilities. I do sew and would like to do more but it is very draining form me to do it due to disabilities. I think knowing how to sew is important as you can fix things you have bought. I am a sewer. Quite a passionate one. Since taking a dozen or so dressmaking classes when I was 12 that opened my eyes to the world of fabric and thread and patterns, I have been learning and experimenting these past nine years. Learning how to professionally alter clothes has been a skill I am so thankful to have. I have made formal dresses (and yes! so much cheaper! ), countless skirts, blouses, boys trousers, dresses – some have been absolute flops, but it is all learning. My love for period costumes (I watch movies just for the costumes ;-), and I sit there watching the 'Special Features' soaking in all the costume designers have to say, much to my sisters amusement!) has inspired me to create a couple of 1800's style dresses – I have discovered this takes me to a whole new realm of dressmaking and tailoring techniques. 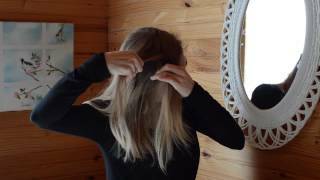 Any girls out there who want to sew, but are not sure where to start… really, just do it! Get your machine out, cut out a simple 2 piece A frame skirt, use good quality cotton, experiment with a zipper, and learn! As you said Olivia, it just takes loads of practice! Knowing how to sew is SUCH a blessing! All the points you made are so true. The older I get, the more I love to sew for myself and others! I love sewing! I make my own clothes as well as quilts and other household items. The biggest sewing project I've undertaken so far is a log cabin quilt I'm working on right now. Sewing is a big help for modesty and it's fun as well. I've been sewing since I was 10 or maybe a little before. You learn your own shortcuts as you learn to sew more complex garments, like Olivia said it is hard when you start out but its so worth it in the end!! Sewing also allows you to make unique gifts for others! Thank you for this post Olivia!! That picture of you and your brother is so cute!! I love what you say about tailored clothes-I hadn't thought about that fact much before, but it is so true! Especially since every company cuts their clothing sizes differently, women get way to hung about things that don't matter much. We are all different people with different bodies, so it is natural to need clothes that are altered in some way to fit us in particular! I have found that knowing how to sew is also a huge way to grow in creativity and personal style. Since I don't have a machine anymore, I am relegated to handsewing for the time, so I don't sew as many things from scratch–but taking scraps of old clothes, or cheap clothes from thrift stores, I can put together garments that are totally unique and fit my personality, instead of whatever is at J.C. Penney's. I love sewing. I like all your reasons here there great. I guess I never really thought about tailoring new clothes before, if something was too big I just didn't buy it, I guess I've always thought if I was going to spend money on new clothes it should fit perfectly, yet when I buy clothes at thrift stores I am always very opened minded about tailoring a piece. I can't sew and probably won't ever learn to, but these are all really great thoughtful reasons. Luckily I have a handy mum who sews and is happy to do simple alterations when I need it. I love your post. Sewing is wonderful and so fun. I love it. I haven't made much, but God-willing I'll be making more things in the near future. I like your reasons for sewing your own things. That picture of you with your little brother is so cute. 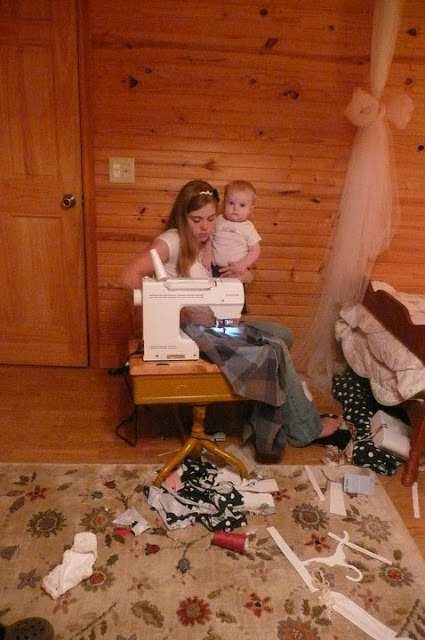 It kind of looks like me, just replace the sewing machine with a piano. I am the oldest of 11 children and have been playing the piano with a baby on my hip since, well, 6 babies ago. It's good to know there is someone else out there who can multitask. This made me smile, Kayla! What a fun time to make memories! I really do just need to put in the work, I know. Right now I'm rocking a Tiny Tailor, which is the itty bitty version of a sewing machine with no reverse. Even thought it's small and finicky Ive managed to make a few pairs of curtains, a quilt and make many alterations to our clothing. I cant wait to get a more substantial machine and do more! I totally agree with your five reasons. I'm 17 and have been sewing since I was about 8. It has been a huge blessing and help to me in so many ways as well as my family and friends. When I went through my growth spurt that's when I really got serious about sewing clothes because I was never finding anything in the stores. Ever since then I've been making clothes nonstop. It's also been a huge benefit, like you said, to be able to alter my own clothes and make them fit just right. As well as doing it for others and helping friends out, and doing mending for some extra money. I came across your sewing blog a few years ago and it inspired me to sew as much as possible. 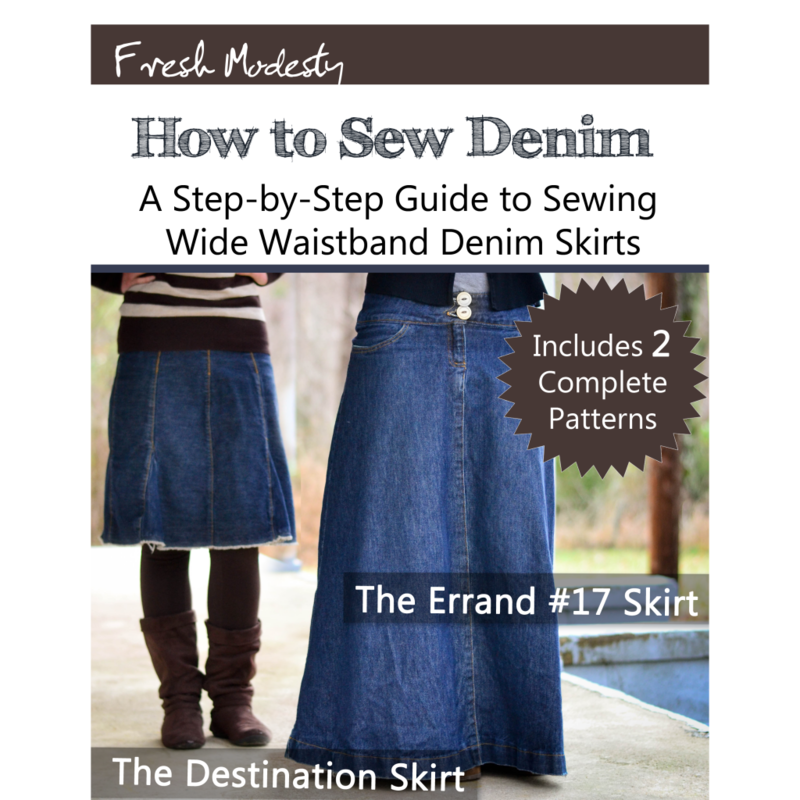 Your denim skirt process has also been a big inspiration to me. I, like you, have a passion for sewing and would love to see it become normal again. Thanks for your encouragement and lovely posts. I've been reading your clog for awhile but haven't commented yet but this post seemed to apply to me 😉 I enjoy sewing but, more than that, it is just so handy. I'm an odd size and have very picky taste so I can rarely find clothes! Altering and tailoring has come in so handy for me! It is just such a good skill to have. Thanks for sharing!!! Yes! Sewing is becoming something of a lost art in this off-the-rack society–so sad. It would be great if more people learned this valuable skill. And I've always said everyone should know basic, sewing skills including guys. After all, what if a fellow finds himself alone, with no wife (or mother or sister) to sew on that missing button or patch his trousers? And yes, fabric (even plain ol' cotton!) is expensive these days, but sometimes one can find fabric at the thrift shop for way less than retail…or even get creative with curtains and (CLEAN!!!) sheets! I SO agree with you on all of your points Olivia! I definitely have a natural inclination towards sewing and working with my hands (I love discovering what makes something work, and how it goes together), and sewing has become an invaluable gift in my life. I hope your post will encourage others to pick it up and give it a try. It may take a bit of patience, but it is SOOO worth all of the trial and error in the end. The baby brother is just so cute! He looks like he's thinking, "Who made a mess? Me? Not Me!" I love to sew! I am a mother of 6 and have two girls…I do find it hard to sew clothes and I get frustrated when every second I need to ask a question and there isn't anyone around to ask. I do lean towards sewing baby bibs, blankets, place mats, and elastic skirts. My goal is to learn to read patterns and sew clothes for me as I can't afford a lot of new clothes. Please post easy tutorials on sewing clothes if possible. God Bless.